TRANSNET yesterday unveiled its R26-billion master plan for the Eastern Cape’s harbours, which will be further developed for mainly business but also leisure purposes. The Port Elizabeth harbour today and an artists impression of what it could look like as SA’s premiere automotive port – below. 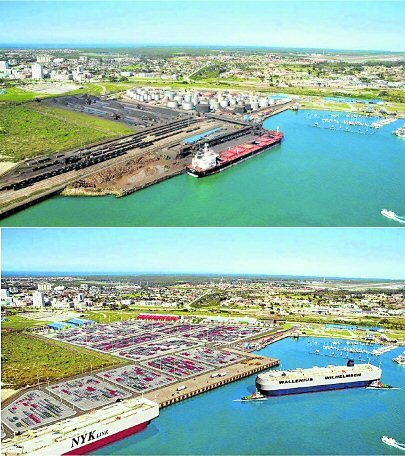 Although the relocation of the manganese ore facility and tank farm has been pushed back by another two years to between 2016 and 2019, the Port Elizabeth harbour will be developed into an automotive and leisure hub. It will form a part of the R26- billion capital investment plan for the province’s three harbours, which is to be implemented over the next 10 years. Transnet National Ports Authority (TNPA) senior planning manager Desmond Simpson presented the port development framework plan at a public briefing at the Marine Hotel in Port Elizabeth yesterday. He described the plan to make the Port Elizabeth harbour the country’s premier automotive port as exciting and spectacular, and said it would include a two-berth car terminal with back of port logistics support, like warehousing, that would be a value add to the Bay’s booming automotive industry. Nelson Mandela Bay Business Chamber chief executive Kevin Hustler said the time lag with the relocation of the manganese and tank farm from themain harbour to the Port of Ngqura was concerning, and asked what had happened to waterfront development. Port Elizabeth harbour port manager Rajesh Dana said the marina development would be an integral part of the harbour’s development and would link up with the Mandela Bay Development Agency’s plans to develop the Baakens River for recreational and leisure purposes. He said the Port Elizabeth harbour development could even include a dedicated passenger berth for cruise liners, “if demand dictates”. The reason the relocation of the manganese facility and tank farm was “behind with a couple of years” was that it was a mega-project that involved the entire rail network up towards Northern Province, where the manganese mines were situated. A market demand for manganese also had to be determined overseas, and it was expected that the first manganese would be exported from Ngqura in 2019. “We are just as frustrated with the time lag, but we must be mindful of the economy. The liquid bulk facility is the sole supplier of petrol, diesel and jet fuel to Nelson Mandela Bay,” Dana said. Asked whether the planned automotive hub would not be an eyesore next to Kings Beach, Dana said the development would be fun, exciting and pleasing to the eye. Transnet’s concept of a “people’s port”, where people will be brought closer to the water, is also planned for the East London harbour, with leisure activities planned along the banks of the Buffalo River. All leisure activities would, however, be balanced with the security and operational needs of the ports. Future plans for the Port of Ngqura would include additional bulk liquid berths that would cater for the planned Mthombo oil refinery, a manganese terminal for the export of manganese once the relocation has taken place, as well as further container terminals, cementing the harbour’s identity as the transshipment hub of Africa. In his presentation, Simpson said the Durban harbour handled more than half of the container traffic in South Africa and plans for expansion would include the building of a mega-container facility. “If approval for a pipeline from Coega to Gauteng is not granted by Nersa [National Energy Regulator of South Africa], we will build additional berths for refined products from Project Mthombo to be handled at the port of Durban. “We have planned for both scenarios whether a pipeline to Gauteng is approved or not,” Simpson said. Asked by Business Chamber president Mandla Madwara whether shale-gas development was taken into consideration with the harbour developments, Simpson said it would be included in the 2015 port development framework plan. If making a general enquiry please leave your question here. When making an enquiry for a Boat Based Tour or a Restaurant Booking please indicate below the Date and Time required. The operator or restaurant will then confirm the availability of tours or a table. Please note: Boat Tours and other activities are weather dependent - your operator will confirm availability closer to the time.